Double Tri-Step Display Featuring the same "stepped" shelf depth (from 36 to 24 to 18 inches), this unit gives you all the visual appeal of our tri-step display... times two, and our patented shared end support connecting system allows you to create aisles of color. 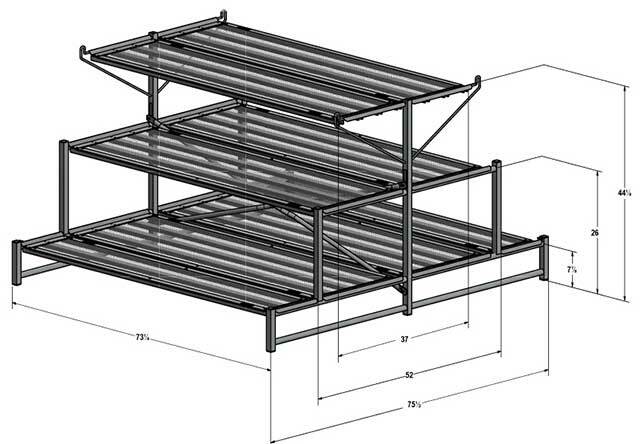 You'll appreciate our tool-free assembly and galvanized steel construction. Choose a configuration with double hanging basket purlins for more display space or the double-sided 7" sign holder for an easy signage option.